Hockey requires every physiological system to be firing on all cylinders. Although it is a gliding sport, athletes need to train dynamically and explosively to increase their linear and lateral speed on the ice. My 35 years experience as a combined events athlete/coach insures that I am been able to integrate all systems within a training plan to provide optimal sports specific conditioning for the game. 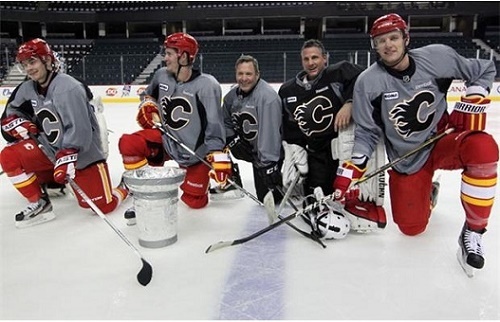 During 19 seasons in the National Hockey League with the Calgary Flames hockey club I witnessed an evolution in training and preparation. The construct of my program has not changed however I am proud to say the specificity and athleticism of the training has evolved to a level that has helped hundreds of athletes achieve success at the highest level of the sport. Check out Rich's Upcoming Hockey Off-Season Development Program and Train Like A Pro . This is a fun shot after a little 4 on 4 game. "Rich would do anything to help out player fitness. Even play in goal if they needed him to!"